TORONTO, ONTARIO–(Marketwired – Jan. 7, 2015) –Continental Gold Limited (TSX:CNL)(OTCQX:CGOOF) (“Continental” or the “Company”) is pleased to announce new channel sampling results from development drifts and cross-cuts in upper levels of the Yaraguá mine at the Company’s 100%-owned Buriticá project in Antioquia, Colombia. Approximately 4,000 metres of total underground development accessing the Yaraguá system has been completed to-date, providing for detailed evaluation of the geometries and grades of precious metal distributions, mining conditions and metallurgical recoveries through the Yaraguá pilot plant. The Company recently released a Preliminary Economic Assessment, based partly on underground development, for the Buriticá project. These results increase the confidence levels in mineral resource estimates for upper Yaraguá, demonstrating higher grades X thicknesses than in the current mineral resource estimate set out in the Company’s technical report entitled “Buriticá Gold Project, NI 43-101 Technical Report Preliminary Economic Assessment, Antioquia, Colombia”, dated December 22, 2014 with an effective date of November 17, 2014 (the “2014 PEA”). The 2014 PEA is preliminary in nature and includes inferred mineral resources that are considered to be too speculative geologically to have the economic considerations applied to them that would enable them to be categorized as mineral reserves, and there is no certainty that the 2014 PEA will be realized. Further, mineral resources that are not mineral reserves do not have demonstrated economic viability. “The results of the ongoing underground sampling in the Yaraguá system complements the Company’s recent bulk sampling of the Veta Sur system and continues to increase the confidence of mineralization between veins, which bodes well for improving dilution expectations,” commented Ari Sussman, CEO. Continental’s 100%-owned, 62,348-hectare project, Buriticá, contains several known areas of high-grade gold and silver mineralization, of base metal carbonate-style (“Stage I”) variably overprinted by texturally and chemically distinctive high-grade (“Stage II”) mineralization. The two most extensively explored of these areas (the Yaraguá and Veta Sur systems) are central to this land package. The Yaraguá system has been drill-outlined along 1,100 metres of strike and 1,700 vertical metres and partially sampled in underground developments. The Veta Sur system has been drill-outlined along 1,000+ metres of strike and 1,800 vertical metres and partially sampled in underground developments. Both systems are characterized by multiple, steeply-dipping veins and broader, more disseminated mineralization and both remain open at depth and along strike, at high grades. See “About Continental Gold” below for a précis the 2014 PEA prepared in accordance with NI 43-101. This release discusses the results of sampling of underground developments in upper parts of west-central Yaraguá. Significant new channel sampling results are listed below in Tables I and II and are referenced in Figures 1, 2 and 3. * Channel samples are taken every 3 metres across drift backs. Composite channel grades are length-weighted averages of three samples. Widths are true horizontal metres at 0 g/t gold cut-off grade. 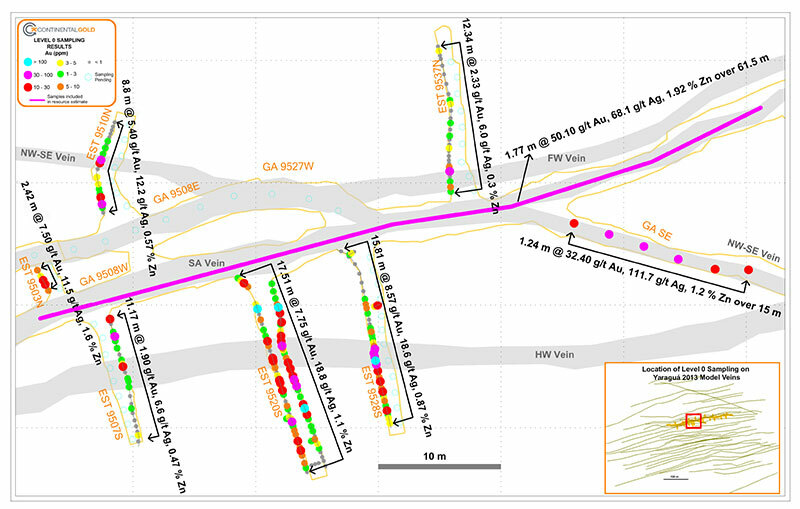 The San Antonio and NWSE vein domains were systematically sampled across the full widths of underground openings on Level 0 (Figure 2), at an average elevation of 1,560 metres. The San Antonio vein domain was also sampled on Level 1 (Figure 3) at an average elevation of 1,496 metres, demonstrating the vertical continuity (at high precious metal grades) of this vein domain in west-central Yaraguá (Figure 1). 32.4 g/t gold, 112 g/t silver and 1.19% zinc, over average width of 1.23 metres along 15 metres (Level 0). These results attest to the lateral continuity of the vein domains at high gold grades over significant strike lengths with true horizontal widths comparable to those proposed for mining stopes. Although some of the Level 0 sampling on San Antonio was utilized in the current mineral resource model, the sampling results increase the confidence levels in mineral resource estimates for upper Yaraguá, demonstrating considerably higher grades X thicknesses than in the current mineral resource estimate set out in the 2014 PEA. Cross-cut walls are continuously sampled, with samples averaging 0.5-metre lengths. Widths are true horizontal metres for length-weighted composite grades at 0 g/t gold cut-off grade. Master veins included in the channel composites are highlighted in blue. BMW is defined as new mineralization encountered in cross-cuts situated between existing modeled veins. These results may support the potential development of mine openings additional to and/or broader than those contemplated in the provisional mining plan in the 2014 PEA for Level 0 and surrounds, over lateral extents of more than 50 metres. Mining dilution at zero grades for gold and silver in the Level 0 area exceeded 50% in the 2014 PEA. The incorporation of higher grades of diluting materials, as encountered in the current sampling, may lead to lower dilutions and recovery of additional precious metals than that stated in the 2014 PEA. Further work is underway to improve knowledge of mineralization between the main veins and related mining dilution grades in future economic studies. Channel samples from the Yaraguá drifts and cross-cuts averaged around 3 kilograms mass and were prepared and fire-assayed for gold and silver by ALS Colombia Limited (“ALS”), as well as being assayed for other metallurgically-significant elements. The Company utilizes a rigorous, industry-standard QA/QC program. Blanks, duplicates and certified reference standards are inserted into the sample stream to monitor laboratory performance and a portion of the samples are periodically check assayed at ACME Analytical Laboratories in Vancouver, British Columbia and/or Inspectorate America Corp. in Reno, Nevada. For additional information on the Buriticá project, please refer to the 2014 PEA, led by M3 Engineering and Technology of Tucson, Arizona with contributions from other independent consultants, including NCL Ingeneria y Construccion SPA which was responsible for the underground mine plan for the project. The 2014 PEA utilizes the May 2014 mineral resource estimate for the Buriticá project, and is available on SEDAR at www.sedar.com on the OTCQX at www.otcmarkets.com and on the Company website at www.continentalgold.com. Continental Gold Limited is an advanced-stage exploration and development company with an extensive portfolio of 100%-owned gold projects in Colombia. Spearheaded by a team with over 40 years of exploration and mining experience in Colombia, the Company is focused on advancing its high-grade Buriticá gold project to production. On November 17, 2014, the Company announced the results of an independent Preliminary Economic Assessment (the “2014 PEA”) on the Buriticá project. The 2014 PEA results included an 18-year mine life based on 20,055,000 tonnes grading 7.80 g/t gold and 19.35 g/t silver resulting in 4,777,000 ounces of recovered gold and 7,088,000 ounces of recovered silver, and utilized the May 2014 mineral resource estimate prepared in accordance with NI 43-101. The study concludes an after-tax net present value at a 5% discount of $1.08 billion and an after-tax internal rate of return of 31.5% on an initial capital cost of $390.3 million with a payback of 2.8 years. The 2014 PEA technical report, entitled “Buriticá Gold Project, NI 43-101 Technical Report Preliminary Economic Assessment Antioquia, Colombia”, is available on SEDAR at www.sedar.com and on the Company website at www.continentalgold.com. This press release contains or refers to forward-looking information under Canadian securities legislation, including statements regarding the estimation of mineral resources, results of the 2014 PEA, exploration results, potential mineralization, potential development of mine openings, potential improvement of mining dilution grades, and exploration and mine development plans, and is based on current expectations that involve a number of business risks and uncertainties. Forward-looking statements are subject to significant risks and uncertainties, and other factors that could cause actual results to differ materially from expected results. Readers should not place undue reliance on forward-looking statements. Factors that could cause actual results to differ materially from any forward-looking statement include, but are not limited to, failure to convert estimated mineral resources to reserves, capital and operating costs varying significantly from estimates, the preliminary nature of metallurgical test results, delays in obtaining or failures to obtain required governmental, environmental or other project approvals, political risks, uncertainties relating to the availability and costs of financing needed in the future, changes in equity markets, inflation, changes in exchange rates, fluctuations in commodity prices, delays in the development of projects and the other risks involved in the mineral exploration and development industry forward-looking statements are subject to significant risks and uncertainties, and other factors that could cause actual results to differ materially from expected results. These forward-looking statements are made as of the date hereof and the Company assumes no responsibility to update them or revise them to reflect new events or circumstances other than as required by law. Figure 1 – Longitudinal section showing the results of new and previous sampling on the San Antonio Vein and surrounds, along with mineral resource categories for this vein from the 2013 mineral resource model. The gold grades of composited channel sample results are color-coded according to the legend. 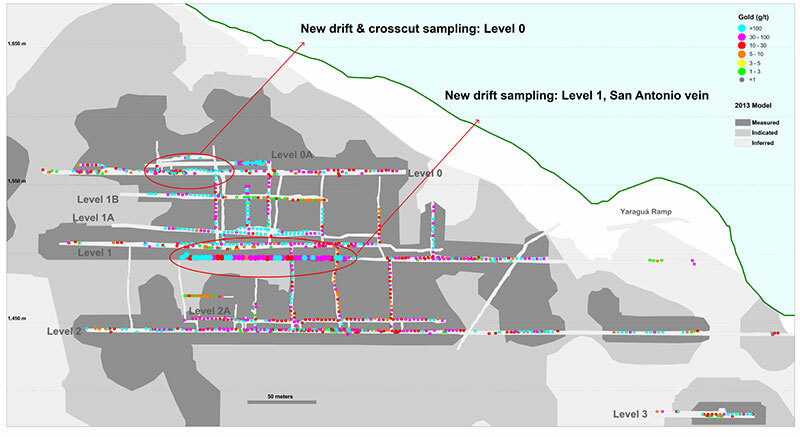 Figure 2 – Plan view of drift and cross-cut sampling on Level 0, Yaraguá, also showing the envelopes of master vein domains in the current Yaraguá mineral resource model. The gold grades of composited channel sample results are color-coded according to the legend. Figure 3 – Plan view of drift sampling on San Antonio Vein, Level 1, Yaraguá. The gold grades of composited channel sample results are color-coded according to the legend.